Handwriting analysis plays an important role in crime scene forensics. Tasks of handwriting examination experts are for example identification of the originator of a given document, decision whether a signature is genuine or not, or to find strokes added to an existing writing in hindsight. 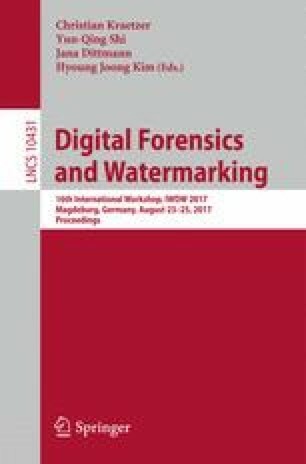 In this paper we introduce the application of an UV–VIS–NIR spectroscope to digitize the reflection behavior of handwriting traces in the wavelength range from 163 nm to 844 nm (from ultraviolet over visible to near infrared). Further we suggest a method to distinguish ink of different pens from each other. The test set is build by 36 pens (nine different types in four colors each). From the individual strokes feature vectors are extracted which allows for a balanced classification accuracy of \(96.12\%\) using L1-norm and \(95.26\%\) for L2-norm. This work has been funded by the German Federal Ministry of Education and Research (BMBF, contract no. FKZ 03FH028IX5). Authors would like to thank the staff of the FRT GmbH for their support and fruitful discussions on relevant features for ink identification. Further, we thank all colleagues of the two research groups at both universities for their advices.